I'm not sure I feel quite right posting Valentine's Day projects when it's not even Thanksgiving yet but Imaginisce just released a new collection called Love You More and we're showing it off on their blogs soooooo, I'm debuting what I created as well. Before I reveal it though, I HAVE to tell you how excited I am with the new direction they took with this collection. This is my favorite collection from them of all time. I love the texture of the paper (no more glossy elements) and the style is just different, in a good way! They also have really great sticker sheets and alphas! The best part is - WASHI!!!! I seriously love it and I'm not just saying that because they sent it to me to create with! Here, let me prove it to you and show you these fun things I made. I decided to make 2 mini albums with this collection; both are for my girls. 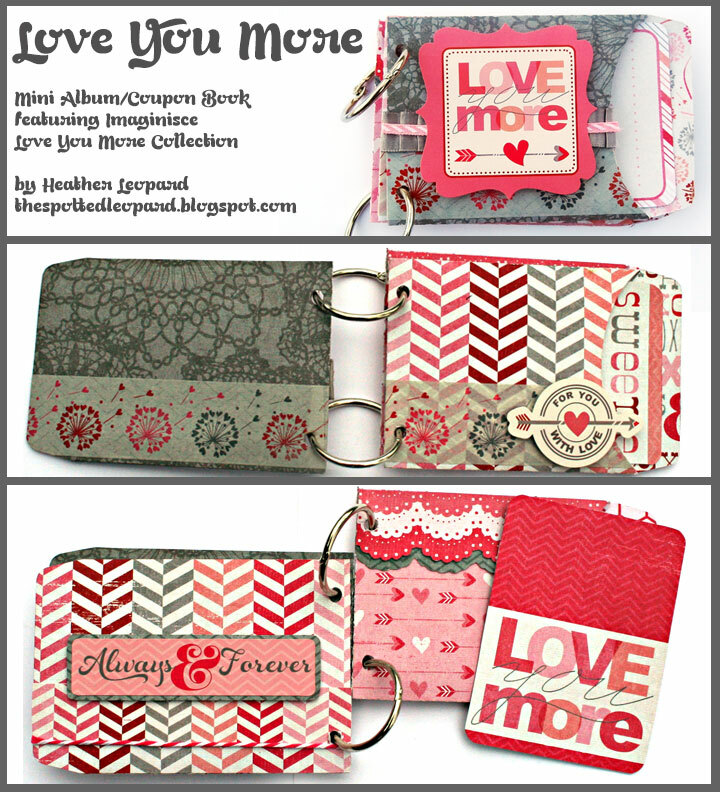 I cut the albums from all the 12x12 paper in the Love You More collection using my CAMEO and various cutting files. The Love You More mini will be a mini album with photos and notes documenting me and my hubby’s love story ‘cause I like to make sure they know how much we care for each other. 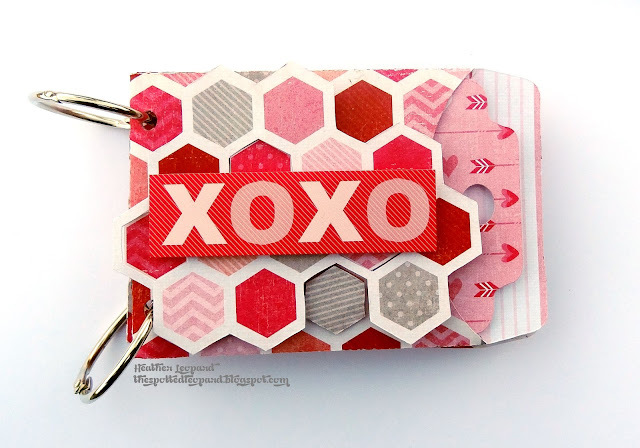 This XOXO one is going to be a coupon book for my girls to. 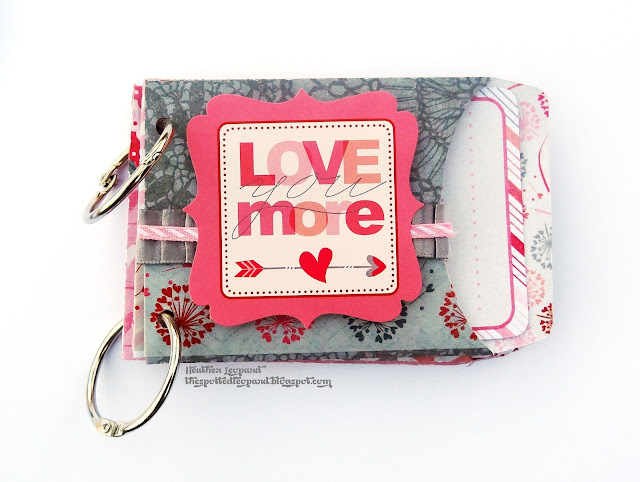 I’ll be adding little coupon notes to the slip in cards for fun activities we can do together as a family in February. Thanks for stopping by today. I do believe Imaginisce is giving away some of this collection this week so make sure to stop over on the blog to find out how to win! 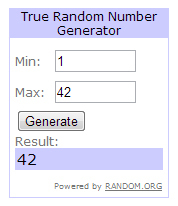 Before you go, the random winner of the Imaginisce goodie box from the blog hop last week is Lynda!!! Please send an email to heather @ spottedleoparddesigns DOT com by November 30, 2012 with BLOG HOP WINNER in the subject line along with your address and I'll get this out to you. If I don't hear back from Lynda before December 1, I will donate the scrap goodies to my daughter's school's art department. Love both of these! Very cute. Very cute mini. 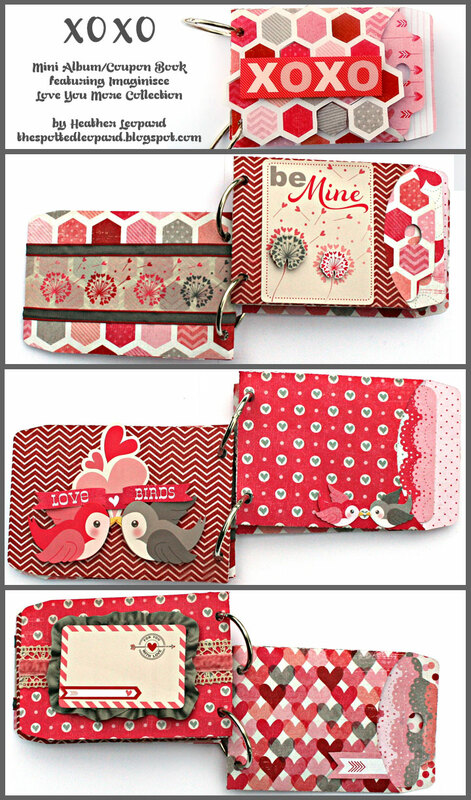 Can't possibly think Valentin yet, still getting ready for my scrappy onslaught in December. Wondeful minis! Great little books to save for a special day! Thank you for choosing my name as a winner! I'll send you an email soon! Really cute mini! I agree that this looks like one of their best linea.